Description The ancient world knew Seven Wonders of the World, but the modern age knows many more. This magnificant illustrated book brings to you over a thousand unique natural features and architectural masterpieces of historic interest from around the globe, including many UNESCO World Heritage Sites. Let yourself be transported to faraway natural wonders such as the wide open spaces of Serengeti nature reserve in Tanzania or the soaring heights of Mount Everest. Marvel at engineering feats like the centuries-old imperial canal between Hanzhong and Beijing, the stunning Alhambra in Granada, the monumental Taj Mahal and the 8.3 kilometre-long bridge between San Francisco and Oakland Bay. 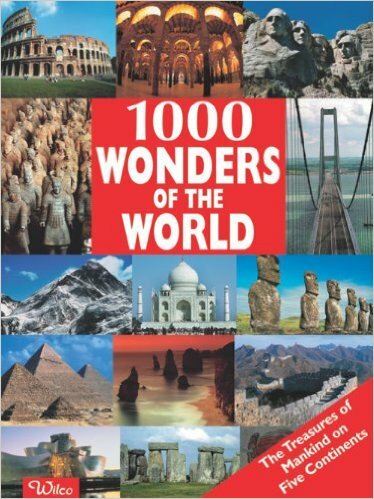 From the historic ruins of Machu Picchu to futuristic skyscrapers and from the frozen plains of Siberia to the sun-baked dunes of the Sahara, the most extraordinary wonders of the world have been gathered for this volume, vividly described and impressively illustrated with colour photographs. Generous-sized maps of each continent and an extensive index complete this spectacular book.